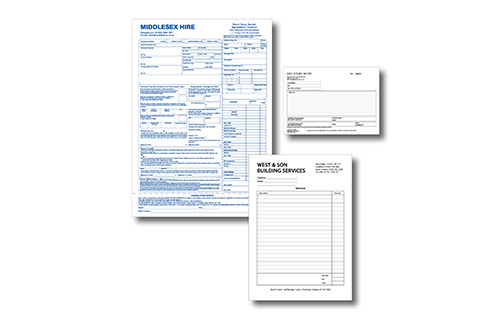 Although completing forms via a PC is now commonplace, companies still use printed forms which are filled in by hand as a more flexible way of collecting and distributing information. We design, print (in black or colour), collate, number, perforate, hole punch, glue and pad forms as required. We offer NCR (no carbon paper required) in A6, A5 or A4 in 2 part (white/yellow or white/pink), 3 part (white/yellow/pink) or 4 part (white/yellow/blue/pink) part – though we can produce any number and other colours of sheets. FAST – Much faster than the internet we mostly design or print in a few hours. LOCAL – We can visit business clients’ offices at short notice. Free local delivery is part of our service.- or you can collect from our centre in Clarence Street. We have a car park for customers’ use behind the centre.